The use of photovoltaic solar energy for the supply to those locations without electrical grid or where electricity is generated by expensive power units is one of the earliest known applications; in fact, solar panels were developed to supply electricity to satellites. 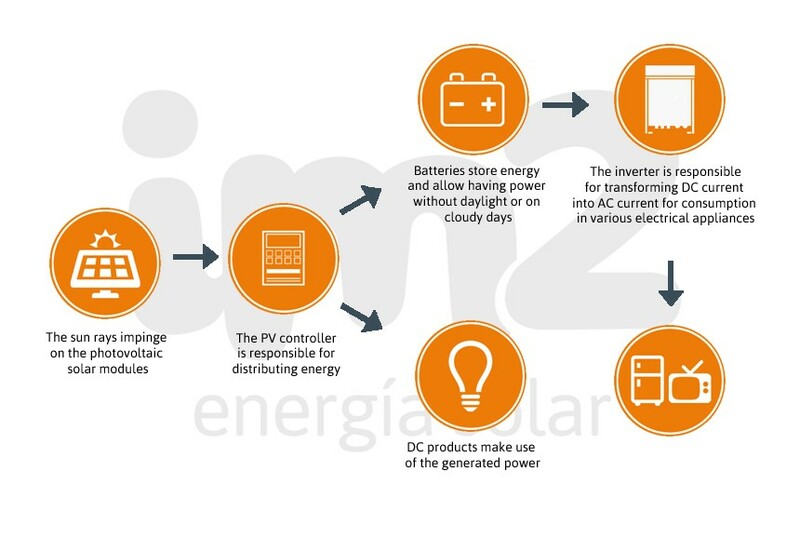 An isolated photovoltaic system generates electricity by means of photovoltaic solar modules. This electricity is consumed immediately, if there is need, and, otherwise, is stored in batteries to be retrieved at the moment there is demand or at night, when solar radiation ceases. Proper sizing and execution of the installation, allows us to achieve a comfort level equal to or higher than that provided by an electrical grid, clean, safe and completely renewable. In the case of consumptions fed by generators, isolated photovoltaic systems allow us to fully or partially replace diesel consumption as well as the tedious tasks of filling the tank, maintenance costs and operating noise that is generated. Are you interested in producing your own free electricity?